We just broke the news of the pending apocalypse to our favorite sellers and they’re all panicking. As a result all of their merchandise is now on sale. Translation: total annihilation for all of us means big savings for you! Click on the shops below, find a tee, “Add to Cart” then “Apply Coupon Code” to save! Use “dirty30” at Defunkd for 30% off. Use “malayavintage25” at Malaya Vintagejunkie for 25% off. Use “hypnorock” at Vintage Maniac for 25% off. Use “11025” at Barefoot Vintage for 25% off. Use “SuperBowlXLVI” at Fatandyz for 20% off. Use “matmin” at PuNkrEviVal for 20% off. Use ” save20” at Black Market Pop for 20% off. Use “AllergicToCubicles!!! !” at Allergic To Cubicles for 20% off. Use “heavysoul” at HeavySoul for 15% off. Use “jackstraw” at Max Vintage for 15% off. 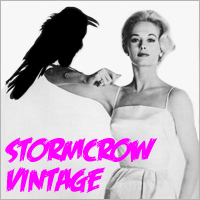 Use “pretty bird” at Stormcrow Vintage for 15% off.